Most kids, unless unduly shy, want you to call on them. Even in large classes where their chances of recognition are slim, they still put their hands up. Question and answer sessions should be fun. You should make every effort to offer positive feedback even if their answer is wrong. To an observer, it seems a simple activity to run, but there is more subtlety there than meets the eye. Questions used to test factual knowledge might be as simple as “What’s the capital of Arizona?” Or your purpose could be to have your students expand their thinking. In either case, there is a right and wrong way to ask questions. The first and perhaps the most obvious rule about is questioning is that you don’t call on a student before you have asked the question. If you say, “John, which president was most instrumental in establishing the League of Nations?”, only John has to think about the answer. The rest of the kids are off the hook. 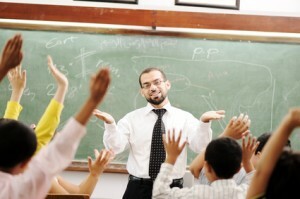 Typically, when you ask a question, a few hands will go up immediately. It is usually the same kids who answer quickly time after time. If you always call on those first few hands, you are effectively limiting your class activity to those few kids. The others will soon lose interest. Wait for a while before calling on someone. At first, two or three hands will go up, followed by a few more, then a few more. How long you wait should depend on the complexity of the question. If you have asked a straightforward question such as “How many feet are there in a mile?”, you’ll have to acknowledge a correct response immediately. However, remember that while questioning provides kids a chance to “show their stuff”, it also allows you to sample the level of learning in the class. The moment you say, “Yes, that’s right”, all the other hands will go down. Sometimes it’s better to offer a noncommittal response so that you can call on others to get their opinion. The point here is that the teacher’s response did not choke off further answers by deeming one to be correct. Even if a student offers a completely incorrect response, you should accept it and go on to the next. After hearing a few answers, you can then discuss it by commenting on the merits of the responses or offering your own input. As always happens, some of your students will never raise their hands. Either they are too shy or simply don’t know enough to respond. Nevertheless, they, too, need to be included. Except during the first few days when the kids are very nervous and self-conscious, you should occasionally call on those whose hands are not up. This serves notice that you want everyone to think about the answers to your questions. Still, though, you need to be sensitive to the idiosyncrasies of your students. Don’t embarrass a particularly shy student with a difficult question which she little chance of getting right. Also, it’s a good idea to ask one student to comment on the answer offered by another. This encourages them to pay attention to each other. If a student is not quick to answer, don’t immediately jump to the next one with his hand up. You should wait a reasonable length of time for the first to answer. Perhaps some help from you would be in order. This is called wait time. Studies have shown that teachers can communicate their impression of a student’s ability by the length of the wait time. If you give up on the student too quickly, she may feel you have little confidence in her ability to answer. What do you do if you are asking questions about something with which they should be familiar, and no one can answer? Perhaps you had the class read a chapter in the text the night before, and you are reviewing the the homework in class the next day. You ask what you think to be a relatively easy question, and no hands go up. So, you call on one student after another, each unable to answer. This is awkward for the students and very annoying for you. The danger here is that as the number of non-responding students increases, the stigma associated with ignorance decreases. This becomes apparent when they immediately say, “I don’t know,” without even pausing to think of something to say. In the next few moments it will become fashionable to be ignorant. Then the kids will start giggling, and you have lost control. When it becomes apparent that your question/answer lesson plan will not work, you need to switch quickly to an alternate tactic. You might have them open their books and list all the important vocabulary words, dates, names, etc. Then tell them you will give them a few minutes to review the information on each one before going back to the questions. The point here is that if you don’t abandon a lesson plan that has failed, you will lose control.